A non greasy Tea Tree Oil spray that helps soothe, calm and reduce irritation from blemishes and breakouts. 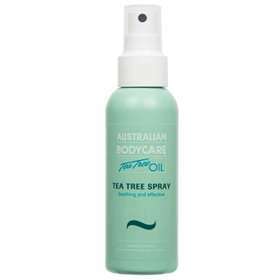 Australian Bodycare Tea Tree Oil spray is ideal for those difficult to reach places such the back and is suitable for all skin types. Not recommended for children under the age of 2 years. Humidifies the skin and aids healing. Suitable for spot prone skin. On clean, dry skin from a distance of 15-20cms spray affected area.